I hate to say it, but depending on your particular schedule, it’s pretty much down to one more week of summer. 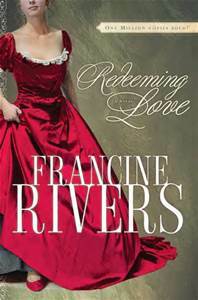 One more week for that Francine Rivers novel, because, of course, you want to read a romance — something with high entertainment value that doesn’t require a lot of mental effort and rewards you with a guaranteed happy ending for the time spent. That’s what summer’s for, right? So, in honor of the good-by-to-summer romance novel, we’re going to look at some of the great romances of the Bible. No, the Bible isn’t known for its great romances, but it should be, because, in essence, it is all one great romance. From beginning to end, it’s the story of God romancing the whole human race — making us in His image so that we could be one with Him, giving us the freedom to love back or walk away, watching us slip away to our own devices, and then doing what was necessary to buy us back, thus embodying that redeeming love that is the theme of the whole story; and not only buying us back, but washing us clean and presenting us to Himself as His Bride. I’m not sure how you can get much more romantic than that. Of course there are stories within the big story like Jacob and Rachel, Ruth and Boaz, Hosea and Gomer, Mary and Joseph and the poetry of Song of Solomon. But it all started with Adam and Eve. Adam was lonely. God saw his loneliness, and from his rib, He fashioned a counterpart to him, out of him, so that, indeed, there was something missing in him that he now needed to complete himself. This is something every man finds in the woman he marries — someone who completes what was missing. This is what he knows when he finds her. This is what makes him sure. Out of all the women out there, this one is “bone of my bones and flesh of my flesh” (Genesis 2:23). This is what happened to me the night Marti and I met. I had met and dated a number of women, but this one I knew would complete me. This is what gave me the nerve to announce on July 3rd (not 4th), a new personal independence day for me: free to commit — free to say I could ask you to marry me, because I’d never felt this way before about anyone. But there is one more part in the Adam and Eve romance that is often missed. When Eve ate of the forbidden fruit and offered it to Adam, he had a choice. As far as I can tell, there’s nothing I can see in the text that says he had to eat it too. God had said if they ate of this fruit they would surely die, and there was Eve, having eaten, offering it to him. Would he be right? Would he be obedient to God, or would he join his woman — his counterpart — in disobedience and the consequences? It doesn’t appear that he deliberated very long over it. If she was going to die, he would rather die with her than be separated. And I understand that. What would have happened had he refused to eat the fruit — who can tell? But one thing’s for sure: you and I wouldn’t be here. And the rest of the story of redemption — of how far God would go to buy us back — would never have been told. And I think that’s pretty romantic, too. This entry was posted in Uncategorized and tagged marriage, relationships, romance. Bookmark the permalink. Up until Adam says to God, ” The woman you gave me…..
Hmm. Interesting speculation, but as Gregory seems to be hinting, there’s nothing in Adam’s response to God that suggests he thought, “Well, I’ll die, too.” But setting that aside, I’ve always been intrigued by what Jack Hayford wondered when he asked, “What if, instead of joining Eve in eating the forbidden fruit, he had instead pleaded with God to let him die in her place?” Now THAT would have changed human history! But it didn’t go down that way — so God sent his OWN son to “do the job,” so to speak. That God — He always has a way to make it turn out right in the end, doesn’t He? Adam was standing right there by her side when the serpent tempted Eve. Adam’s first opportunity to take the initiative to protect his bride, yet did not step between her and Satan. Then as an earlier post stated Adam blamed God, “The woman you gave me…”. Passive-aggressive nature of man still today…guilty…thank you Christ for grace that covers these failures by man. I also like that “other way” of looking at it. My husband and I are married almost 46 years in a few weeks. In the beginning it was rough – we were so young and so very selfish – it took us a long time to learn what ‘love’ was really all about. But even back then, no matter how bad things were, we would rather be together than contemplate life apart from each other. We are each other’s best friends, always having each other’s back, always encouraging the best, and walking together ‘through the valleys’ when we fail….kind of like Jesus does for us.